ProtoSphere was built on Windows. 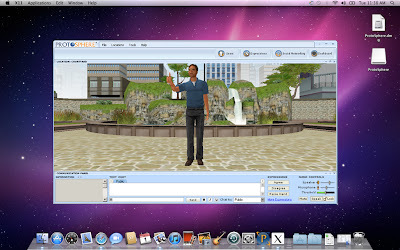 In fact, it is the only virtual environment of its kind to be built exclusively on Microsoft technology. But that doesn't mean Mac users can't take benefit from ProtoSphere as well. Over the past year, we've had many requests from users for a Mac version of ProtoSphere. That's been a result of increased use of the application outside of the enterprise with external, customer-facing engagements, such as CME, KOL activities, professional education, and speaker bureaus. And frankly, given Apple's resurgence, we're starting to see more Macs in the enterprise today. When we looked into it, we found ProtoSphere was architected in such a way that it was entirely possible to produce a Mac version. This is not unlike how Microsoft has a version of Office for Windows, but also has a version of Office for the Mac. If you build your apps right from the get-go, portability is possible. We created a SWAT team of developers who have been hard at work over the past few months porting over our Windows-based ProtoSphere Standard Edition platform so that Mac users can take full advantage of what the environment has to offer. Existing ProtoSphere users will notice little difference in functionality between the two flavors of the platform. In fact, the majority of the functionality, even the user interface, is identical. The new version will be supported on OS X Leopard and OS X Snow Leopard. More details to come as we continue development.